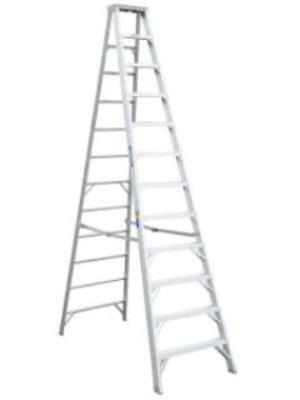 This 12' aluminum step ladder has a maximum load capacity of 300 lbs and allows for a maximum safe standing height of 11' 6", as per the manufacturer. The ladder width is approximately 38 3/4" and the spread is 91 3/4", and it weighs 66 lbs. * Please call us for any questions on our ladder 12 foot step rentals in Hillsdale and Ridgewood NJ.